The Thelin Gnome is a charming small pellet stove that looks for all the world like a traditional pot bellied wood stove. 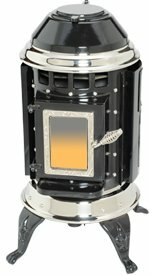 The interior workings provide all the convenience of a pellet stove. Capable of heating up to 750 square feet, (a small home or cabin), the Gnome produces 31,300 btu. and is available in six porcelain ceramic colours. Battery backup is built in to the Thelin Gnome - all you need is a twelve volt power lead and a deep cycle battery. The battery will automatically be trickle charged. A thermostat is available as an option. Heating Area 750 sq. ft.
Max. Heat Output 31,300 btu. Window Size 6.5 ins by 4.7 ins. Rear Vent Height 11.25 ins. Colours Ebony Black , Ivory, Teal Green, Cobalt Blue, Burgundy Red, and Rich Brown in a porcelain enamel coating. Construction Type Fabricated steel body, cast iron top, door and legs. The 'Gnome' has a 'clean' setting which uses its fan to clean the combustion housing and the fan blades making this very easy.